Archarya Nyima Tsering lived a life of a scholar, a poet, and a practitioner. It is with sadness that we relate here the sad news that he breathed his last at 9.14pm on 10th Febuary, 2011 in Dharamsala. He had been ill for some months and had prepared for his departure from this life without clinging to anything. From giving his farewell advises to students, family members, friends and well wishers to mentally preparing himself for the final departure, he displayed the quality of one well acquainted with the practice of Mind Training. He was one who nurtured an intense passion in the teachings of the Lord Buddha, dedicating most of his time and energy in study and contemplation. Archarya Nyima Tsering was a prolific writer and had written books on Buddhist practice and Philosophy. He had also translated the whole ranges of volume of Kunkyen Gowo Ramjampa, an important and respected figure in Tibetan Buddhism, particularly in the Sakya tradition. He cherished the works of Dza Patrul Rinpoche and had also translated two of his important works: "The Lotus Garden Play" and "The Way of Living". Though he studied the Geluk tradition in the Tibetan College at Varanasi, he maintained a non sectarian practice while keeping a special interest in the Dzogchen practice and the works of Tsongkhapa. In this era of decadence and in this difficult period in the history of Tibet, a person of his knowledge and enthusiasm is a great loss for Tibet. Though he is no longer with us, his works are there to serve humanity for a long time. He only lived for 47 years; yet he lived a meaningful life, always aspiring to do something of greater purpose. His dedication to Dharma kept him for two decades in the small town of Dharamsala, where he continued to receive teachings from His Holiness the Dalai Lama and many other eminent masters. He also taught to many and inspired all his friends and family members towards Dharma. Though short, his life was lived with a vision and purpose. He had never been separated from the blessings and teachings of His Holiness till his last days. With his unwavering devotion and faith, this will always continue. One who gathers causes for a better rebirth will definitely bear the fruit. As such, we are confident of his next birth to continue his legacy of this life. The memory lives and the works will continue to inspire. May he be never separated from the blessings and guidance of his most respected lama His Holiness the Dalai Lama and may he be born again among us to continue his journey in the paths as shown and taught by the Buddhas of three times. 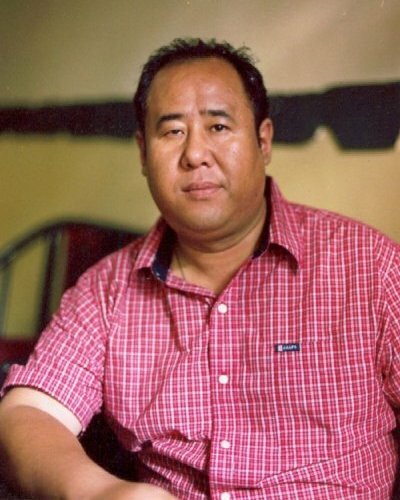 Acharya Nyima Tsering (1963-2011) graduated from the Central Institute of Higher Tibetan Studies in Sarnath, Varanasi, where he attained the Acharya (Master of Philosophy) degree in 1993. He conducted research on Buddhist Philosophy, worked as a translator of Buddhist teachings for international student groups, and lectured at universities and other institutions in the USA and India. He also participated in seminars, gave workshops and lectures organized by Tibetan government and non government organizations. In addition, he published translations and his own commentaries on major Buddhist teachings, and authored scholarly articles, romantic and patriotic poems in English and Hindi.